Thoughts on the manner in which the commercial side of things might be affected by 'the world recession' as may the individual. These plans are for O14 scale, but would work in both OO/HO, one a possible industrial layout, the other a variation of an Inglenook. A small UK coal mine in OO designed in OO for public operation at shows. American prototypes for small space low budget HO layouts having a short line theme. Using Peco Code 83 NMRA standards Streamline track. Box Metals (Reprocessing) Ltd a very compact UK type layout in OO of a scrapyard in a box file. Two earlier scenic HO American layouts having considerable operating potential, and worth further consideration. 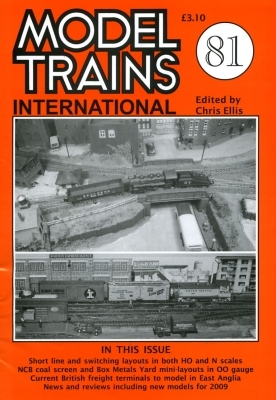 Modern East Anglian Freight Terminals described.